This year we are holding our service in Weymouth’s stunning Greenhill Gardens looking out across the bay, at 6.30pm on Thursday 23rd August 2018. Everyone attending will be given the opportunity to write the name of those they are remembering on a small sunflower to hold during the service. Those who take part in the Appeal will have their loved ones names added to our new Sunflower Memory Board which will be on display and the focus of this year’s service. 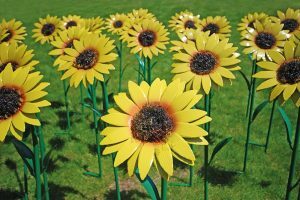 For those who would like to take one of our large metal sunflowers home with them (along with their small hand held sunflower), a limited number will be available to buy on the evening of the service. Lesley Dove’s daughter, Gemma, died in sad circumstances.Gemma had learning disabilities and autism so was unable to convey her needs and wishes when she became seriously unwell. 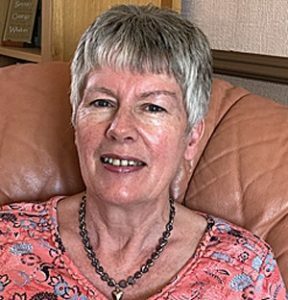 Although Gemma was not a patient of Weldmar at the end of her life, Lesley has since found significant comfort through attending Weldmar’s Sunflower Service. “The thought of a wonderful setting, in beautiful gardens, overlooking the sea, on a summer’s evening, where I could reflect on memories of a departed loved one, drew me to the Sunflower Service in Greenhill Gardens. It did not disappoint.